With New York City constantly on the brink of destruction, there’s no time to for joking. This far-cry from a comic book characteristic places it on the number 9 spot on the countdown. The fact that Peter spins a tangled organic web lands on the number 8 spot. The pairing of Tobey & Kirsten (Today, the pairing would be called Tobesten) makes the list in the #7 spot. 6. Sandman is Uncle Ben’s Killer? In Spider-Man 3’s half-witted attempt at justifying it’s story, this unforeseen revelatory story line appears in the number #6 spot. In continuing from the previous plot hole, a common sense look at some ill-timed important news will show why this scene deserves to round out the top #5 of blunders in the Spidey trilogy. 4. Spider-Man, Come and Stop Us If You Can! AKA Venom’s guest star appearance. This lackluster final sequence & everything leading up to it scrambles its way onto the number #4 spot on the countdown. The casting choice of Kirsten Dunst bothered many and we’ll see why she deserves the #3 spot on this list of what went wrong. 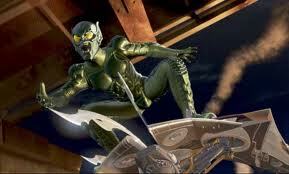 The Green Goblin’s movie outfit makes an unusual fashion statement as it styles and profiles its way to the #2 spot. Only thing missing is a word bubble that says, “It’s Morphin’ Time” with a Power Morpher in hand. Peter Parker’s impromptu dance number struts its way to the #1 spot… for ALL the wrong reasons. So there you have it, the 10 worst aspects in the Spider-Man trilogy. If you want to see the best moments, click here! How did you feel about this list? Post a comment and let us know! And find out if The Amazing Spider-Man learns from these mistakes when it swings into theaters on Tuesday July 3, 2012! A+ casting on JJ Jameson. About the only thing they got right.